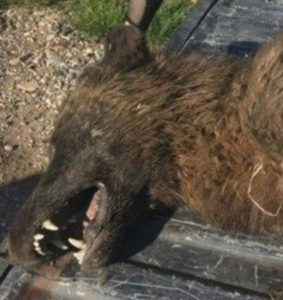 Social media is buzzing today about this story, about a strange, wolf-like creature that was shot and killed in Montana on May 16th. It’s clearly not a pure breed wolf, but people are claiming it may be the thought to be extinct direwolf, the infamous Dogman, a werewolf, or some other mythical devil dog. DNA tests are pending, but my bet is that this isn’t a werewolf, dogman, or el chupacabra. A large wolf-like animal shot and killed in Montana has wildlife officials and social media wondering what it was. A rancher shot the gray-haired beast on May 16 when it ventured too close to his livestock in Denton. The rancher reported that he killed a wolf but wolf specialists looked at photos of the animal and doubted it was a purebred wolf, ABCFoxMontana reported. “The canine teeth were too shot, the front paws too small and claws on the front paw were too long,” Montana Fish, Wildlife and Parks spokesman Bruce Auchly said in a news release Thursday. “Nevertheless, social media was quick to pronounce the animal as everything from a wolf to a wolf hybrid to something mythical,” he said. The Great Falls Tribune also reported that the animal shared many characteristics of a wolf but that its large ears, short legs and body and its fur stood it apart. I love a good mystery as much as the next guy, and nobody wants new cryptids to be discovered than I do, but my guess is that this is either some sort of hybrid wolf, maybe mixed with dog or coyote or other canine, or a wolf with some sort of genetic disorder that caused body dysmorphia. Either way, we should have our answer soon enough.